A look at the use of use of paper, cloth as and mixed media as an expressive art form from the use of paper as a sculptural/textile medium, its use with textile to mixed media books forms and hangings. Transform paper and combine it with textile and stitch to create small postcard size samples. Students will explore ideas related to design and the creation of textile papers (momigami) and look at different ways of texturing and transforming found surfaces. 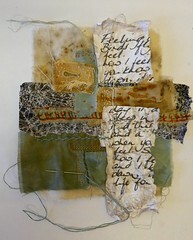 The focus will be on hand stitching as an extension of mark making and drawing, and various means of layering.